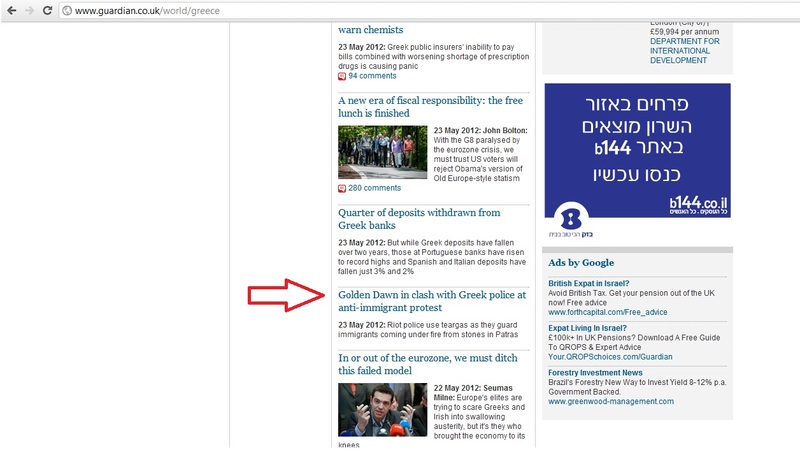 Compare and contrast: Guardian coverage of demonstrations in Israel and Greece. This week we witnessed a much reported demonstration in south Tel Aviv pertaining to the subject of the influx of illegal migrants into one of the poorest areas in Israel. As ever, the situation is significantly more nuanced than the Guardian’s editors would have us believe – as reflected in the commentary of veteran Israeli journalist Ben Dror Yamini on the subject. “It was all known. It was all expected. A violent incident was a matter of time. Sentences such as “South Tel Aviv neighbourhoods becoming a pressure cooker” have been written more and more in recent weeks. This week it happened. A justified and legitimate demonstration, which was directed against government neglect, was turned by a few tens of people into a hooligans’ parade. It is a miracle that the events did not end in bloodshed. That could happen. This is the hour of the hitch-hikers. From Left and from Right. The former spread tales that if we would only conquer racism, and turn the refugees into new immigrants, they would become honest and contributing citizens. For a small proportion of them – annoying and inciting; mostly anarchists – there is in the background the ideology which wants to crush the state of Israel as the Jewish state. The infiltrators are yet another means by which to achieve that aim. From the Right step up to the line the inciters who suffer from pure racism – including racism against colour – and direct the anger towards the infiltrators themselves. 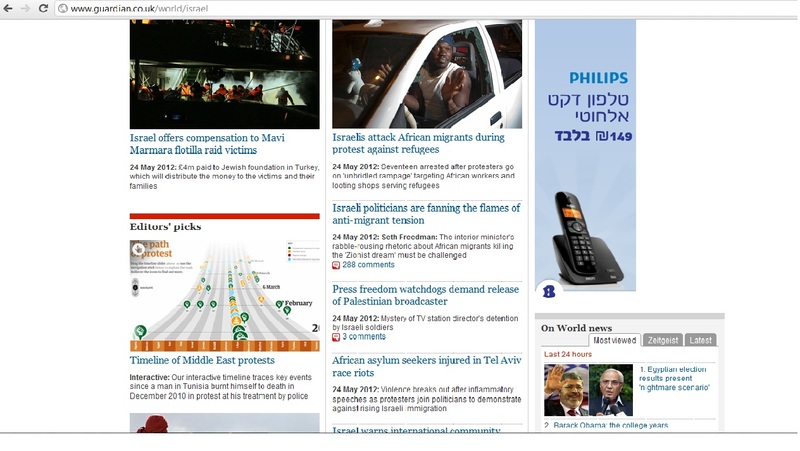 The incidents which took place on the night of May 23rd in south Tel Aviv were the subject of no fewer than three Guardian articles. The first, by Conal Urquhart, was headlined “African asylum seekers injured in Tel Aviv race riots”. Only in the ninth paragraph (out of ten) did Urquhart get round to hinting – albeit very superficially – that there may actually be more sides to the story than pure ‘race riots’. The second article dedicated by the Guardian to the subject was Seth Freedman’s polemic (addressed by Adam Levick here). Freedman also employed the term ‘race riots’ and referred to “the level of hate coursing through the veins of Israelis furious at the influx of non-Jewish Africans into their country”. His article closed with the warning that “Israeli opponents of such base racism must act now”: again presenting a one-dimensional view of the story. The third article on the subject published on the same day as the previous two came from Harriet Sherwood. It too focused exclusively upon the reprehensible acts of violence which took place and it too failed to provide any information on the broader context of the events or to examine the reasons why the residents of south Tel Aviv (the majority of whom did not participate in the violence) felt compelled to voice their opinions on the streets in the first place. But Israel is not the only country struggling with the effects of uncontrollable immigration and Tel Aviv was not the only place in which a demonstration turned violent this week. In Patras, Greece, local residents and supporters of the far-Right ‘Golden Dawn’ party – which gained considerable support in the recent Greek elections – stormed a factory in which migrants were sheltering on two consecutive days after a local man was allegedly stabbed and killed by an Afghani immigrant, resulting in clashes between demonstrators and police. The Guardian dedicated one article to these incidents. In that story there were no ‘race riots’ – instead there were “anti-immigrant protests”. No ‘asaGreek’ was summoned to chastise his countrymen for the “hate coursing through their veins” and nobody was accused of “base racism”. There were no dire warnings about the collapse of Greek democracy and nowhere was it implied that the Greek demonstrators (even those among them who support an extreme-right party) were motivated by a racism which infects their society as a whole. The sharp contrast between the style and volume of the Guardian’s reporting on two similar incidents which took place almost at the same time is an excellent indicator of the fact that when it comes to Israel, reporting the actual news is frequently of minor concern. Too often, it is the opportunity which that news may provide to advance an agenda which is seized at the detriment of providing Guardian readers with a ‘fair and balanced’ view of events. Thanks you CIFWatch for all your work. This article was so brilliant in showing the hypocrisy and hatred the Guardian has towards Israel. Israel should kick out Harriet Sherwood. I’d rather like to see Israel invite Sherwood to a televised debate which should then be posted on YouTube. Douglas Murray might be a good choice as opponent. Let’s all have the pleasure of seeing her tested on the subject she is paid to report on. Meanwhile, there are several articles doing the rounds on the Tel Aviv demonstrations but none that I know of offer up the perspectives present in this one. As a result of reading them I feel the status of those in question has been – shall we say – flexible. Are they immigrants, illegal immigrants or refugees? The same with so called “liberal” Der Standard in Vienna. While the demonstrations in israel are called racist, the demonstration of the right extremists in Greece are only xenophobic according to Der Standard whose journalists are as biased as the ones at The Guardian. Looks like one of those scums at the Standard is following my comments.